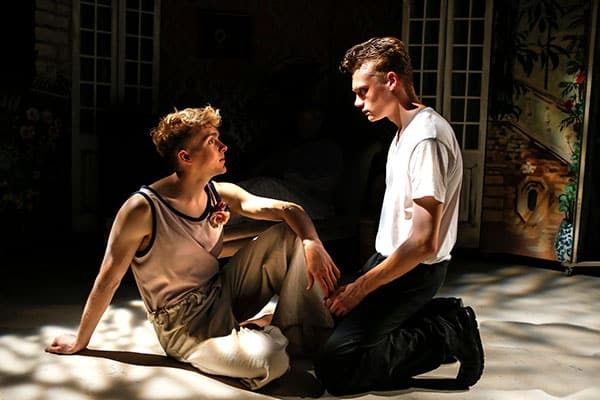 Jojo Macari empathetically performs the role of Joshua, a young boy living an oxymoron life: upper-class and poor – but, together with builder boyfriend, Damien (Denholm Spurr), Joshua tries to escape class restraints and better their lives. Having had no family unit throughout his childhood, and still haunted by bruising family affairs, Joshua seeks out his great-uncle Napier (Bernard O’Sullivan), a privileged, eccentric and self-important old man, now bedridden with only servants and ghosts to keep him company. Throughout, Uncle Napier is engulfed in reverie, telling stories of days past – those spent with Seigfried Sassoon and Virginia Wolfe, and those spent dancing to Igor Stravinsky. 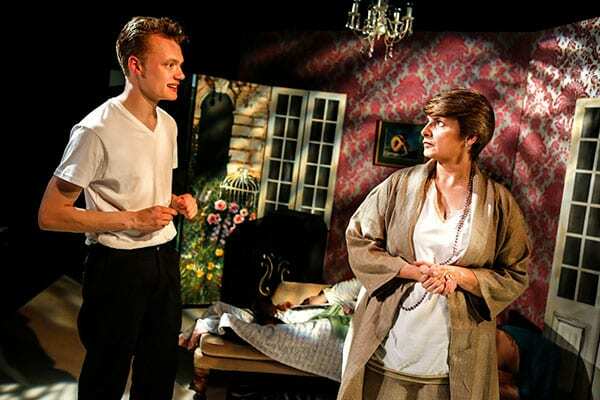 But, when his ghost visits (Nick Finegan) – a past spry version of his present grey and aging self, Napier is tormented and becomes wrought with death anxiety, desperate to preserve his youth. 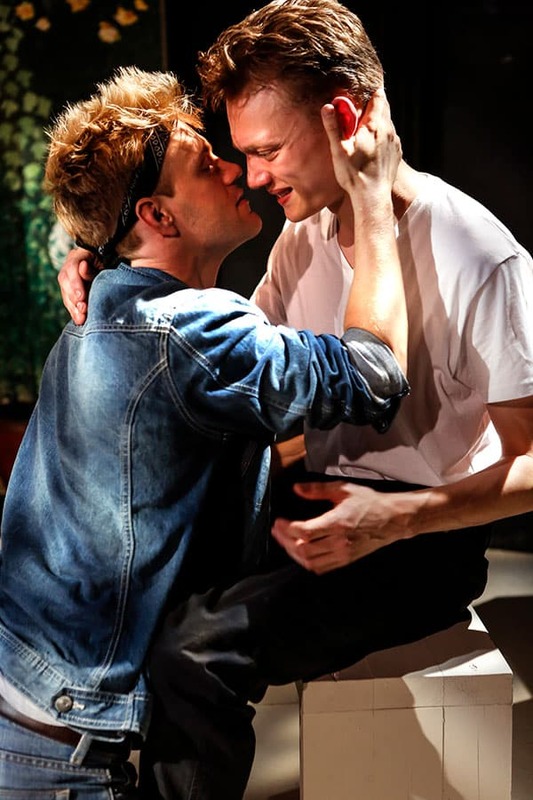 As Joshua and his uncle build their bond, Damien encourages the idea of an impending inheritance, only challenged by Joshua’s already rich cousin, Patrick (John Rayment). For me, the script resonates with Oscar Wilde and his Dorian Gray, and whilst watching the performance I thought it would make a good novel. Although there are some well-written legato dialogues, the script is, sometimes, a little cluttered, and certain scenes are rather staccato. Additionally, there are times when certain intimacies feel contrived between the characters and this creates some incoherency in the tale. Despite this, the story is interesting and often relatable, especially with the discussion of thanatophobia (the fear of death). The feeling of being detached from our youth can be as overwhelming for us as it is for Uncle Napier, as we try to delay the inevitable which cannot be preserved. After all – we are not a marmalade. Nick Finegan’s young and romantic Napier is a well mirrored performance of the elder version, and Denholm Spurr is wholly invested in Damien – a cockney whippersnapper, as well as his French sailor, Jean Baptiste. Old Uncle Napier’s reminiscences and desperate attempts at compliment fishing are delivered by Bernard O’Sullivan with genuine sentimentality and wit. His battle with ‘past vs. present’ is, at times, rather touching, as he tries to cling on to any physical object which may conserve his youth, fearing the reality that his past is simply (and still very vividly) preserved only in the powder of his memories. Napier is not only bought to fruition by O’Sullivan’s performance, but by Rosie Mayhew’s set design, as the character’s whimsical personality is physicalised by eccentric furnishings: pink patterned wallpaper, a tacky chandelier and a zebra print rug decorate the bedroom and screens are pencilled with drawings of sailors and images, which could have been painted straight from Napier’s daydreams; a shimmering silver sheet and a white lace blanket cover the chaise lounge and Napier fingers pastille coloured chiffon scarves between nostalgic monologues. ‘The Past is a Tattooed Sailor’ plays at The Old Red Lion Theatre until 27 August 2016. 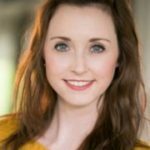 Alexa Terry trained in Musical Theatre at Bath Spa University and, since graduating in 2011, she has been involved in many projects as a professional performer. Caught in a game of tug-of-war between the pen and the stage, Alexa studied Comprehensive Creative Writing with Oxford Open Learning, and later attended classes with BML (Book, Music and Lyrics) as a librettist.